Customer Testimonials | Rewatchable, Inc. Customer Testimonial Videos provide your business with a unique opportunity to build trust with prospective customers, strengthen relationships with existing ones, and to develop some incredibly positive, compelling marketing collateral that your Sales team will love. Rewatchable captures powerful, unscripted testimonials. It’s one thing for your Sales staff to talk about how great your business is, but that’s expected, common, and mostly written off by market-savvy prospects. How much more powerful would it be for your prospects to hear how great you are from actual happy customers? By showing your prospects on-demand, enthusiastic, third-party endorsements, Rewatchable’s Customer Testimonial Videos will help to develop increased trust in your prospects, accelerating the sales process and helping to convert leads into customers. You do great work. Your customers are happy. They’re more than willing to recommend you to others, but maybe the opportunity seldom (never?) arises. 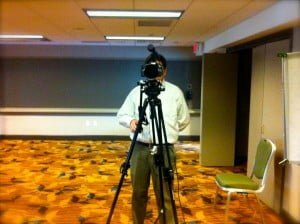 Producing a Customer Testimonial Video has the unique effect of reinforcing existing relationships – both by your business recognizing and appreciating its best customers, and by the customers themselves going through the process of crystalizing and expressing what it is specifically that they love about what you do. It’s a great experience for everyone involved. Rewatchable uses compact, lightweight equipment that allows for a quick setup and a non-intimidating environment. Rewatchable uses tested interview techniques and a unique lightweight production process to make the customer testimonial video production process fast and painless for your volunteers, ensuring that your existing relationships are preserved (even enhanced) while building trust with new prospects. How do you feel about bragging? You probably have to keep a fairly subdued, professional tone in your marketing collateral, right? Well, your customers don’t. Rewatchable’s Customer Testimonial Videos often feature the kind of exciting, high praise that companies are seldom willing or able to lavish on themselves. They’re a ready-made license for your customers to say all of the great things about your organization can’t say without seeming immodest or ‘over the top’. View of what a client sees during a customer testimonial shoot. We’re light. We’re fast. We’re flexible. 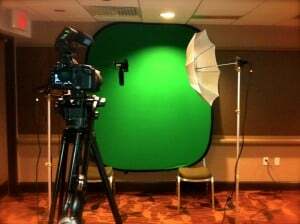 When you need to get a Customer Testimonial Video, you’ve got a customer who’s agreed to speak, and you need to make it happen ASAP, Rewatchable can usually send a small team to your customer’s location, set up, film a great video, and be out of your customer’s way in under an hour. We’ve put a lot of care and effort into selecting equipment that enables us to create high quality video with minimal intrusiveness, and Rewatchable can create a remarkably positive, fun, and exciting experience for your customer in an incredibly short amount of time. If you’re going to add a number of Customer Testimonial Videos to your sales and marketing arsenal, it can often be a great experience for you to bring your customers to you. Rewatchable can capture the Testimonial Videos, as well as great B-Roll (cutaway footage that we splice in to make the videos more interesting) of those same customers touring facilities, meeting with your staff, etc. It’s a great excuse to get some great marketing materials and also just to get a nice, friendly on-site meeting with a valued customer. If your company conducts User Groups, User Forums, Roadshows, or attends conferences, chances are that you’ll have a lot of your best customers in one place at one time – a perfect opportunity for gathering Customer Testimonials! We can set up in a small corner of an unused banquet hall or conference room, and conduct interviews at an average rate of 3-4 customers per hour. Because hotels and conference facilities tend to be boring/bland/ugly, we’ll often use a green or blue screen so that we can digitally superimpose your company’s brand colors and logo after the fact.